An American raised by gurus in Indian returns home to become a guru of his own, working to help a hockey player win back his ex-girlfriend. An American-born boy abandoned near an Indian ashram is taken in by gurus, raised to become a guru of his own. 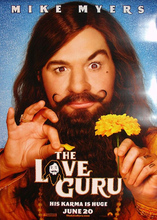 As an adult, the man returns home as "Guru Pitka", quickly becoming a noted self-help expert and darling of the media whose unorthodox teachings earn a devoted legion of followers. One day, Pitka is asked to help Toronto Maple Leafs player Darren Roanoke win the love of his life back from rival Jacques Grande, embarking on a gross-out-gag-filled quest to use his methods of advice to help Toronto achieve their dreams of Stanley Cup glory on the back of Roanoke's play.